Yemenite soup is a simple chicken soup eaten in Yemen and especially typical of the Jewish Yemeni community. In Israel today Yemeni soup is the staple of the Jewish Yemeni diet and is served both as a standard lunch or dinner or Shabbat meal. Each house hold has its own favourite version of this simple and nourishing soup but common to all recipes is the inclusion of the typical Yemeni spice mix, Hawaij. Here in Israel you can buy a premixed Hawaij spice mix and it is available in most Middle Eastern grocery stores. Basic ingredients of Hawaij are: Ground cumin, turmeric, black pepper, cardamom seed, and coriander seeds. Grind the above spices together and then add 1 tablespoon of turmeric. Mix all together. Bring a large pot of water to the boil and put in the chicken pieces. Once the water comes back to the boil, throw the water away and clean out the pot. Also rinse off the chicken in cold running water to get rid of any foam or fat that may be on them. Now start again with a pot of fresh cold water and the chicken. Add all the ingredients except the Hawaij. The fresh herbs can be placed tied in a bunch and removed later or simply chop up the herbs and add to the soup. Bring the soup to the boil and add the Hawaij. 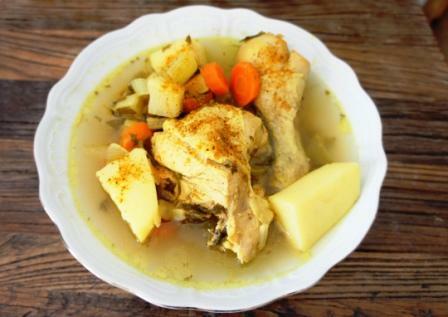 Turn down the heat and let the soup simmer until the chicken and potatoes are cooked. The Yemeni chicken soup is traditionally served with bread and Hilbe (a paste made out of fenugreek seeds) and a chilli relish called S’chug.